Low prices. OrangeSmile.com offers car hire service in Djibouti on the lowest-rate-guarantee basis, since we work with car suppliers directly. For your search criteria in Djibouti, we always select and show the best rental offers. The car reservation process consists of 3 simple steps: (1) search for available cars for your dates in Djibouti; (2) select your car type; and (3) fill in the booking forms. Once the reservation is completed, you will receive a confirmation voucher to your email address. During the booking process, please check your rental conditions. To pick up your car at the rental point in Djibouti, you need to provide our confirmation voucher, your driving license and a valid credit card. The final payment is normally carried out at the pick-up point. Our car hire points in Djibouti accept VISA, MasterCard, etc - please check your rental conditions. At the pick-up point, please read the handling manual and check the car for present defects. OrangeSmile.com wishes you a pleasant journey to Djibouti! The car hire reservation system OrangeSmile.com allows renting a vehicle in Djibouti within 10 minutes. Our largest database of car suppliers enables us to provide you a rental car in Djibouti at the cheapest rate ever possible. At rental locations in Djibouti we offer the following car sizes: mini, compact, economy, standard, premium and luxury. The following car types are available in Djibouti: Sedan, Hatchback, Jeep, Cabriolet, Coupe, Minivan and Minibus. This African country was unknown for the majority of tourists for a long time until recently, when it was named an emerging travel destination by many respectable magazines. As the political unrest in Djibouti has calmed, unusual nature and interesting nature landmarks of the country never cease to attract travelers. Rest in Djibouti can be varied and includes surfing and water skiing, windsurfing in the desert, and observing nature and historic landmarks of the country. The country has hot climate with mostly absence of water, but there are two lakes closer to its central part. Lake Asal is known as the lowest point in Africa and the third lowest point in the world. The crater lake with salt water, which is a part of the Afar Depression, lies as deep as 153m below the sea level. The concentration of salt – 34.8% - is even higher than in the Dead Sea. There is one more salt water lake in the country, Lake Abbe. The lake has quite a cosmic view with its 50m high chimneys made of limestone and steam coming out of them. The reason of the steam is Dama Ali volcano located on the northwest side of the lake. 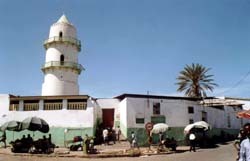 The capital of Djibouti, the city of Djibouti, is a large sea port and both cultural and economic heart of the country. Here visitors are recommended to visit Marche Central of the central market. The market is open early in the morning and doesn’t close until late afternoon. This is a wonderful place to see bustling city life, locally made goods and souvenirs, hawkers and outlets that sell nearly everything. Other popular landmarks in the capital include the Presidential Palace and Hamouli Mosque. Finally, Djibouti beaches are a great way to relax during a hot day. Other regions of the country also hide many interesting places. The Goda Mountains are the location of the Tomb of Sheikh Abu Yazid. Fans of diving and snorkeling should head to Tadjoura, where they will be able to enjoy coral reefs and beautiful underwater life. The city is also one of the easiest places in the world to spot stunning whale sharks. If you want something unusual, try a desert safari and ride a camel among sand dunes. Finally, there are different entertaining activities offered on local beaches. Some of them are quite unusual like kite flying, which is very popular with local people. You can save on GPS-navigator if you pre-download all the necessary maps to your smartphone and use them during your trip in Djibouti. In order to find a rental office at the airport in Djibouti, leave the baggage hall and move to the 'Car Rental' area, following the special signs. When you reach the car rental area, please check in to the window with the name of your rental company.